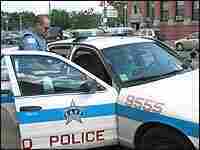 On the Beat in Chicago's South Side In the wake of high-profile cases of excessive force and other misconduct, police officers in the nation's largest cities are under increasing scrutiny. We go out on the beat with two Chicago police officers: a 38-year veteran and a rookie. NPR's David Schaper reports. In the wake of high-profile cases of excessive force and other misconduct, police officers in the nation's largest cities are under increasing scrutiny. We go out on the beat with two Chicago police officers: a 38-year veteran and a rookie. NPR's David Schaper reports.